Elyssa Patrick has been a member of the Romance community for years now, and I’m happy to see her succeed as an author. She also has a thing for rock stars, but who doesn't, right? 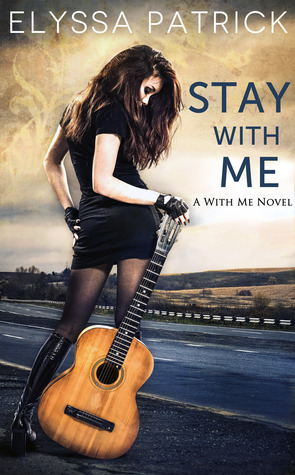 Her latest book, Stay With Me, released earlier this week, and it’s a New Adult story about a very famous young star that grew up in the spotlight and is ditching Hollywood to go to college and maybe have a chance at a normal life. Things aren't that easy for her, but at least she meets a dreamy guy who makes it all better. Elyssa has kindly offered an e-copy of Stay With Me to give away on the blog today, so this is going to be a quick giveaway post. For a chance to win, fill the Rafflecopter thingy at the end of the post and also leave a short comment saying you’re in, so that if Rafflecopter malfunctions I can manually pick the winner. Contest open to all. Elyssa Patrick. August 30, 2013. Ooh this seems really interesting! Entered the competition, as this seems like a cool read. I'm a musician myself, and enjoyed the musicness side to 'If I stay' sounding good though. Blogger likes to eat comments, so I suggest copying it before hitting "publish" just in case it doesn't go through the first time. This is a pain, I know, but it's the only solution/prevision I can think of, and it will save you the frustration of losing a comment. Also, thanks for visiting!